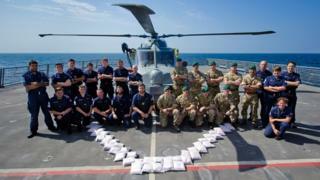 Heroin with an estimated £9m street value has been seized by a Royal Navy warship in the Gulf. Crew on Portsmouth-based HMS Dragon discovered 49kg of the Class A drug hidden on a vessel travelling on a notorious drug-smuggling route. It was the fifth successful raid by the Type 45 Destroyer in three months. The drugs have since been destroyed. The Royal Navy said the sale of such drugs was a known source of funding for terrorism in the region. The vessel carrying the drugs was identified by HMS Dragon's Wildcat helicopter on a smuggling route known as "Hash Highway" ahead of the successful raid. Boarding officer Lt Laurens Williams said: "The team worked hard over long hours to ensure that any concealed narcotics were found. "The inventiveness of the drug runners necessitates a detailed search to ensure that we do not miss any potential hiding places." Defence Secretary Gavin Williamson said: "Heroin destroys lives but, thanks to the tireless work of HMS Dragon's crew, these criminals will not be distributing this poison and will instead face justice. "These drugs would have had a wide distribution network across the globe, highlighting exactly why we are committed to the region - because Gulf security is our security."